Health professionals need to learn the communication skills that will create collaborative and mutually satisfying relationships with patients. The failure of doctors to relate effectively to patients results in noncompliance, malpractice suits, longer stays in hospitals and other negative outcomes. Interpersonal skills can be easily learned by studying the techniques described by Gordon and Edwards. 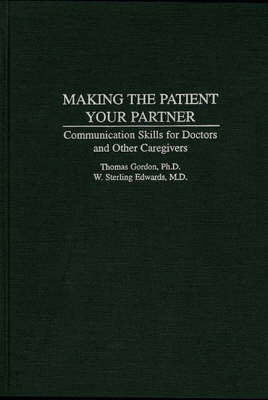 Using cases, interviews, dialogues, and vignettes, the authors provide effective models or blueprints for health professionals to follow. The skills are generic and improve interpersonal communication throughout the spectrum of medical specializations and services. Gordon is a psychologist who has pioneered internationally recognized effectiveness training programs widely used by teachers, parents, salesmen, managers, and other professionals. He has published six books that have sold over five million copies in 17 languages. In this work, he has enlisted the expertise of Edwards, a highly respected medical doctor and educator, to provide the necessary insider's view of the health profession. Together they make a convincing case for doctors to develop closer and more collaborative relationships with patients.